The Mojave animal preserve is home to a host of beautiful critters. You can visit them, say hello, and even purchase some lavender bars, almond praline bars, or vegan cheezes, too. 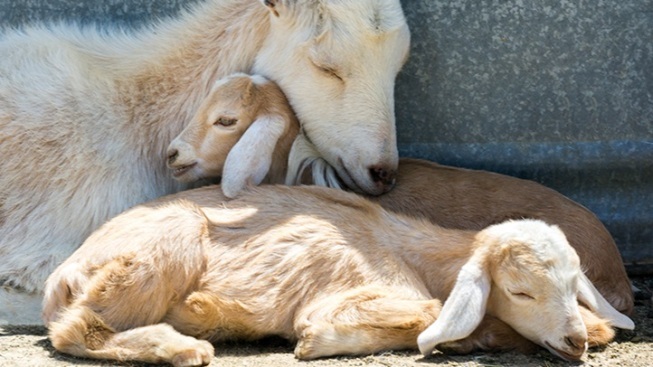 BABE(S) IN THE CITY: If you've called upon the northeast corner of Third & Fairfax in the City of Los Angeles, you may have had an unexpected farm-fantastic moment, if you found yourself wandering by The Sanctuary at Soledad Goats table at the Original Farmers Market. The clocktower-close booth has been a somewhat recent staple on the north side of the Third & Fairfax landmark, and while the variety of vegan treats displayed might have understandably caught your eye, you also likely took time to coo over Kaboom, a handsome goat, or Sage, an inquisitive little kid, or Edgar Allen Pig, who does love attention. THESE THREE CUTIES, along with their people, Julian and Carol Pearce, make regular trips to the city as representatives of a Mojave-based sanctuary known for its commitment to animal care and its stance against cruelty. Of course, The Sanctuary at Soledad Goats is also well-loved for its open-door policy, welcoming anyone who wants to come say hello to the cows and horses and donkeys and goats and pups and parrots and ducks and pigs who call the place home moo home ("moo" is, of course, "sweet" in goat-speak). VEGAN GOODIES: If the names of the humans ring a bell for you, you likely are a fan of the Pearces' vegan goodies, such as their almond praline bars, lavender bars, and peanut butter truffles. But Julian and Carol have a background in critter care, too, meaning the sanctuary they oversee is all about doting upon the furry, horn-sporting, hoof-happy residents. The duo also boast expertise in the making of goat cheese, but they've fully turned to vegan products in recent years. To check out their new cheezes — that's right, with a "z" — just eye the tempting line-up on the sanctuary's online home. YOU CAN HOBNOB MOST DAYS... with a few animals at the Original Farmers Market, if you've timed your swing-by just right, but to see many more beasties and the whole sanctuary itself, best plan a day trip up to Mojave, north of Lancaster. You'll need to schedule your hello in advance of arriving, but this page should help (and there are a few tips on what to wear and bring to the sanctuary, including "clothes that can get dirty!"). It's a place "Where Every Animal Has a Home," and love and attention, and if scrolling through the sweet pictures of the sanctuary's sweet-face'd denizens doesn't have you making a date to visit... Oh wait. You probably already have.